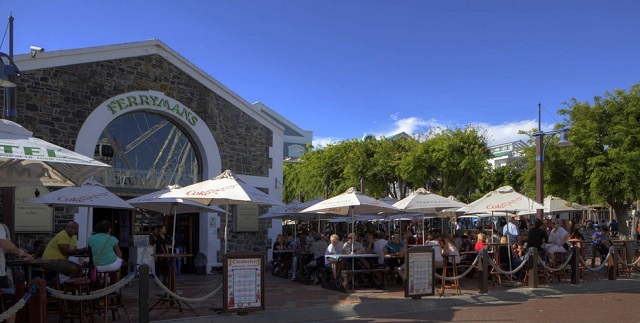 Ferrymans Tavern at the Victoria & Albert Waterfront opened in 1989. As we all know the live music scene ain’t what it used to be in Cape Town. Gone are the days of 30 music venues for bands. As an agent and lover of music, I am grateful to Ferrymans for providing a space for music in Cape Town. Ferrymans has nine gigs a week, Monday to Sunday nights as well as Saturday and Sunday afternoons. It’s been my privilege and honour for ms events to book the music there for the last three years. Not only have the owner and manager looked after and supported many Cape Town cover artists, but throughout the summer months, they have featured many of Cape Town’s/South Africa’s original acts too, including Robin Auld, Wendy Oldfield, Lionel Bastos, Cindy Alter and Ella Mental to name a few. The beer garden is the perfect place to showcase live music, complete with awnings for shade and protection from the South Easter as well as heaters for a cosy feel in winter. Kids are welcome too with a play area and kiddies menu. They offer their very own Ferrymans Ale, brewed exclusively for the pub, alongside a huge range of domestic South African, local handcrafted and international beers. Highlights from the kitchen include the daily specials, often featuring South African specialties and fresh seafood, alongside a regular offering of grilled dishes, vegetarian options and classic pub grub. Sports fans are also catered for, with big screen TVs playing all the big matches. See the gig guide on our website for the full schedule of upcoming gigs at Ferrymans. We attempt to cater for all tastes, from Pop and Rock through to R&B and African.